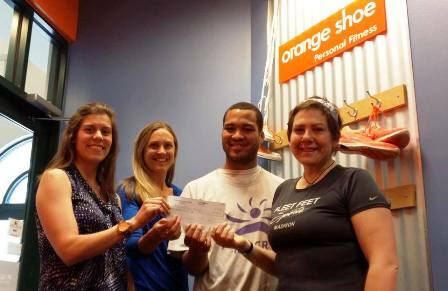 Lauren Birkel, owner of Orange Shoe Personal Fitness West, along with Coach Erin Birk,facilitated the Whole30 program, from which a donation of almost $600 was given to the Allied Running Club’s “Food As Fuel Initiative.”! What is Whole30? : For 30 days, you eliminate the most common inflammatory foods in your diet and replace them with foods that promote energy and a strong immune system. At the end of the 30 days, you slowly reintroduce foods into your diet to determine which foods serve your goals best! Thank you to all of the Orange Shoe Whole30 folks!